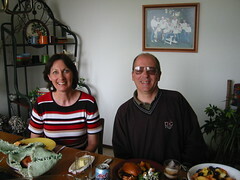 One of Esther's cousins, Nancy, and her husband are visiting from Arizona. Their parents live in Portand and Lynden and we fit in on a stop in between. Doug works with the Arizona Corrections Department helping men earn their GED. Nancy is completing her masters degree in Teaching English as a Second Language. We enjoyed an evening with them, catching up on eachother's lives. Markus and Calvin went up to Lynden for a couple of days. I poured the last section of the retaining wall at the neighbors. I also wrestled a dryer replacing the heating element. Success! It works. Plese tell Doug and Nancy that John Gallegos says hi.